These digital products have been saved as png files at 300 dpi. They come with no drop shadows (except as alternative on banner). Check your files as a small number of the elements were sold at a previous store as part of "Picnic at Grand Lake" kit. Includes buttons, flowers, paper bits, fasteners, baubles, and more! 70+ elements in all. "For each day". Per Diem. Every day we live our story. From moment to moment our story reveals itself through events and happenings, through circumstances, through relationships. Story lives in our routines and in all the "ordinary" things. Story lives in our perceptions and emotions and interactions. It lives in our choices and how we spend our time. And Per Diem is all about keeping those memories and documenting your story...for each day. Inspired by the little moments that weave themselves into bigger tapestries of Story, the Per Diem collection features cheerful color, classic and versatile pieces perfect for documenting your daily stories. 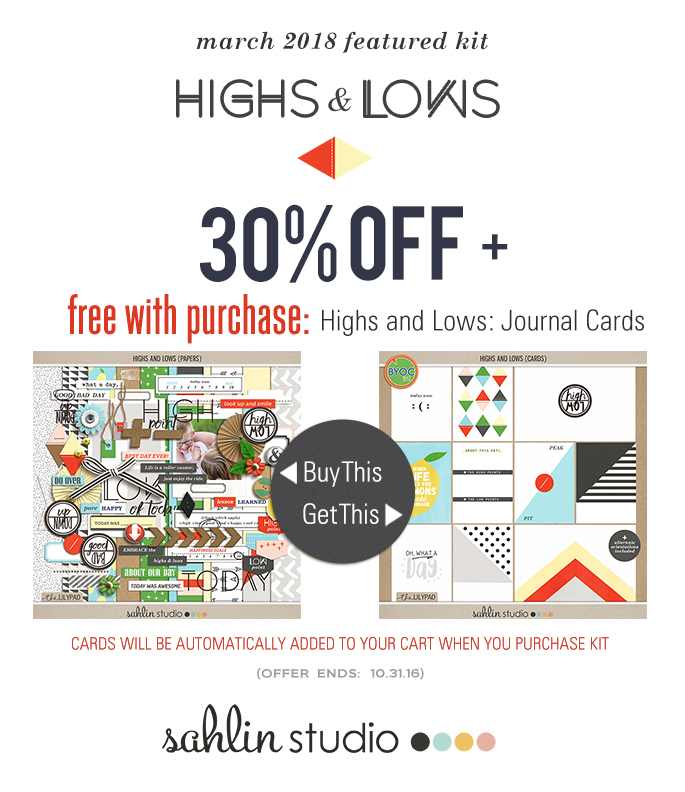 You can use these journal cards to enrich traditional scrap pages, or in your pocket scrapbooking. From listing, to describing to cataloging, these cards will guide your steps as you journal your memories. sentiments/concepts include: "beautiful life", "love this with my whole heart", "little moments", "real life..plot points. story details", "collect memories (24.7)", "file under: to remember"
All products are created at 300 DPI for optimal printing quality. Please see my TOU for full terms. I hope you have fun scrapping your own stories with the Per Diem cards! The BYOC May Styles are a perfect addition to your style collection! These beautiful styles will be a perfect complement to your BYOC goodies. There are three style sets each in the beautiful BYOC colors. As always styles work in PSE & CS! Life is a beautiful ride, full of ups & downs, good days & bad - and it's so important to capture it all! 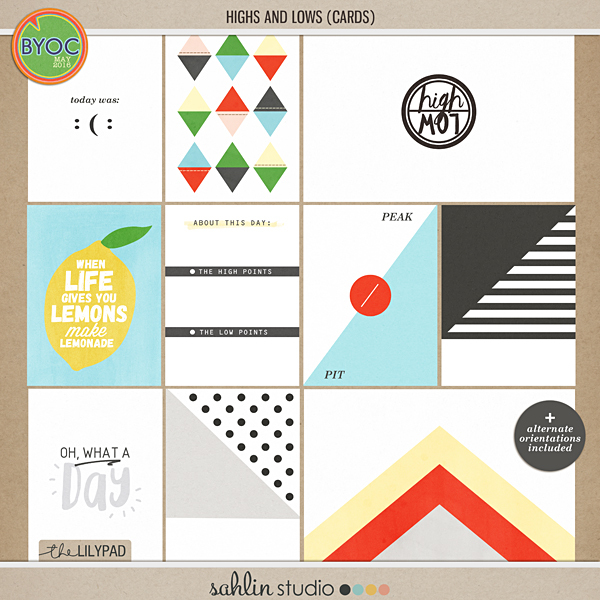 Whether life is just a bowlful of cherries right now, or you are getting ready to make some serious lemonade from all those lemons getting tossed your way, make your own bit of sunshine with my bright and cheerful Highs & Lows: Elements set! Packed with bold graphics, saturated colors, and stylish typography, this thoughtfully curated element collection is just the thing for scrapping all the moments in your life in an authentic way - from your happiest highs to your hum-drum lows. Great for digital or hybrid creations! Coordinates beautifully with May 2016's BYOC. Bent Paper Alphas are a little creased, a bit messy, and totally fun! Every character in each of the 8 sets is uniquely creased for a more natural look and endless mix and match possibilities! Individual png files. 77 pieces in each set, for a total of 616 pieces. Coordinates with my Eclectomania 4 papers and the rest of the May 2016 BYOC. Eclectomania 4 is a fun, colorful set of papers with 9 beautifully textured solids and 22 eclectic patterns from floral to geometrics. Coordinates with my Bent Paper Alphas and the rest of the May 2016 BYOC. Created with love at 300ppi. The companion pack to my Farmer's Garden doodles, On the Farm focuses on the furry and feathered barnyard friends to be found down on the farm! Perfect for recording memories of farm trips and visits to the petting zoo, On the Farm contains the following hand drawn doodles: barn, cat, chick, cow, donkey, duck, 2 boy and 2 girl farmers, feed bucket, feed sack, goat, goose, hay bale, haystack, hen / chicken, hen house, horse, milk bucket, milk churn, pig, rooster, scarecrow, sheep, sheep dog and tractor. 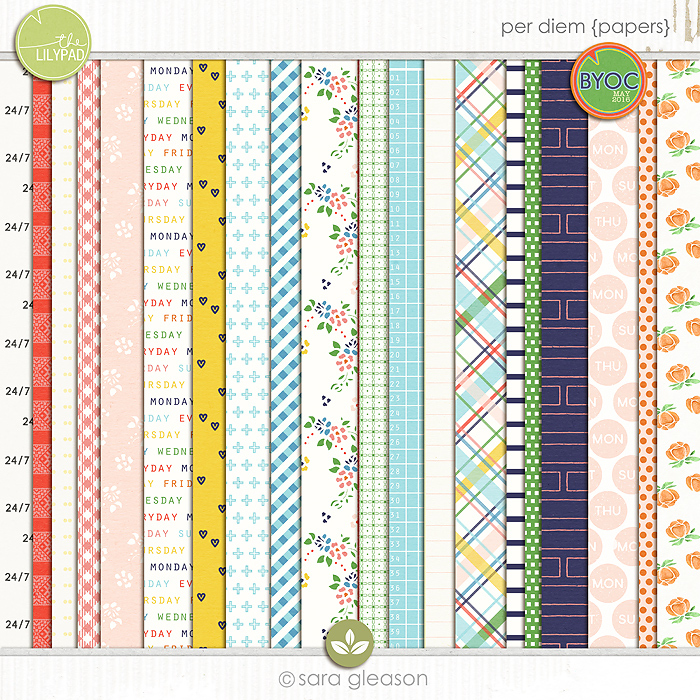 Including many hand painted flower stickers, layered veneer titles and elements, paint, gems + buttons, ribbon and other fun accents to help you build beautiful pages. 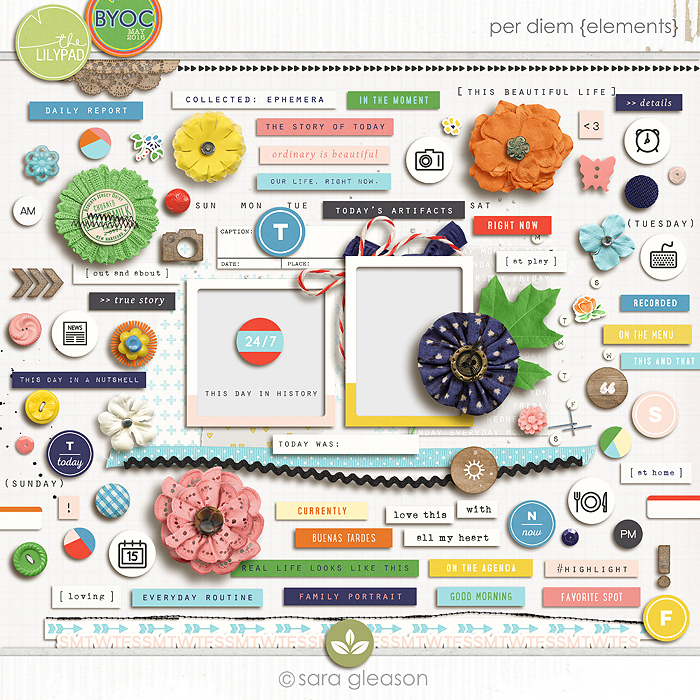 Included in this pack are 60+ elements as previewed. This pack of Papers are part of the May Storyteller Add-ons AND the May BYOC. Included in this pack are 28 various papers including 11 solids. Papers are 12x12 JPGs and saved at 300ppi for optimal print quality. This pack of Alphas are part of the May Storyteller Add-ons AND the May BYOC. Included in this pack are pre-shadowed, dimensional leather alphas in 8 colors. Uppercase, numbers and a few symbols in PNG format for fun and easy title building for your digital scrapbooking layouts + project life style pages. Includes drippy, messy, happy letters A to Z in png and brush format. Each letter has 3 variations for realistic stamping/brushing. Ampersands, periods, and bonus paint smears also included!